Surrounded by secrecy, it is home to the wildest dreams and darkest nightmares. Incredible amounts of money have been lavished on it. The best minds of two generations have labored to build it. And somehow, bit by bit, it is claiming the Earth’s most valuable resource – its children. I hate to admit this, but I judged this book by the cover at first. I knew nothing about the book when I started listening, I hadn’t even read the blurb in the description. 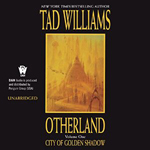 I saw a fantastical-looking image on the cover and, knowing that Tad Williams typically writes fantasy novels/series, I just assumed it was a fantasy novel. I was wrong. This is actually a cyberpunk book, a quite good one at that. There was only one downside to the book, which I may as well get out of the way now: it’s not a complete story. The book ends with no plot lines resolved and more questions than answers…so, if you read this book, be prepared to read at least the next book in the series (River of Blue Fire. I say “at least” because I have only just started that book (and it’s 24.3 hours long! ), and I have no idea if it resolves any of the story. There are 4 books in the Otherland series in total (City of Golden Shadow, River of Blue Fire, Mountain of Black Glass, and Sea of Silver Light, the first two of which are available in audio so far). The entire plot is engaging, if sometimes a little confusing to keep track of who is where (especially at first, as the world and characters are introduced). That said, the book drew me in more or less from the get-go, and I found excuses to listen more as I went about my days. Williams, unlike many authors I’ve read recently, is able to describe the world and the technology organically through the telling of the story. Where some people would spend time info-dumping, Williams is able to make the world comprehensible by explaining things to characters, or having the reader go along with the process of discovery with the characters. For a book written in 1996, Williams was somewhat a visionary of technology and how people use it. In the book, there are VR systems (think: Oculus Rift taken to the extreme), normal day-to-day use of the internet, tablets, videophony…things that are in the early years of widespread adoption now. The characters in this book are very interesting. I’ve read a lot of complaints, recently, from people who wish that there were more women and/or minorities in the books that they read, especially genre fiction. This book doesn’t have that problem. Reny is a South African black woman, and one of her closest friends through the story is a native African. One of the main villains is Australian and there seem to be people from across the globe involved in either the world or trying to study the world. When Reny needs help, she turns to another woman (another professor in computer science-type fields) for aid, and though men are involved, they are on an equal footing with the women. While I normally don’t fault a book for having weak female characters, it was refreshing to have such diversity in the book. George Newbern’s narration was fantastic, if a little slow. I found that I had to bump up the playback speed slightly, otherwise it felt like the pauses were a little too long, the speech a little too slow. This made some of the characters or world aspects a little hard to understand at times (pronunciation-wise), but that didn’t detract from the story. 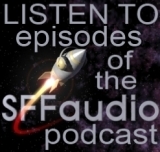 It was always easy to keep track of who was talking and what was going on, thanks to Newbern’s voices for the characters and for the main narration. All in all, I really liked this book. I wish it had come to some form of closure, or at least given some more hints on the motives of the villains, but that’s a minor complaint. I’ve already started the second book and can’t wait to see where the story goes.